Hannibal bed and breakfast travel guide for romantic, historic and adventure b&b's. 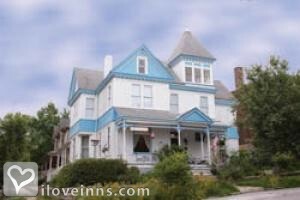 Browse through the iLoveInns.com database of Hannibal, Missouri bed and breakfasts and country inns to find detailed listings that include room rates, special deals and area activities. You can click on the 'check rates and availability' button to contact the innkeeper. Hannibal is known for being America's Hometown and home to Mark Twain and his boyhood home. Come sleep where Mark Twain slept. By Garth Woodside Mansion. Perhaps one of the most popular places in Missouri is the small town of Hannibal. Considered the primary place where both the jazz and blues music originated, Hannibal has remained an interesting city in the state of Missouri. Boasting several museums, amusement parks and attractions, Hannibal will keep you and your entire family entertained during your stay. The activities available in Hannibal are practically endless. There is the Busch Stadium, the Forest Park, The Gateway Arch as well as the Jefferson National Expansion Memorial. Hannibal is also proud of its Cave Springs Historic Site and Nature Center and the Battle of Carthage State Historic Site. After a long day relax at a Hannibal bed and breakfast and gather your energies for the next adventure. By Garth Woodside Mansion.